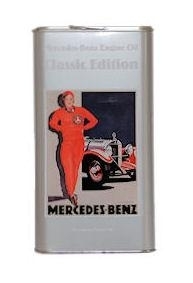 ORIGINAL MERCEDES BENZ PRODUCT. SAE 50 monograde engine oil with a low additive content for use where an SAE 50 viscosity was recommended by the vehicle manufacturer. It is specifically designed for pre-1945 cars and motorcycles as well as for use in classic commercial vehicles. Supplied in a LIMITED EDITION nostalgic 5 Litre metal can. BUY NOW as this item will not be repeated! This item may have slight storage related dents to the can and very light surface rust to the bottom rim. The contents are perfectly in order.